Vietnam was great and we could have spent a lot more than the three weeks we spent touring. Starting with a base in Hanoi we were able to see Halong Bay and Cat Ba island, before traveling up to the Chinese border near Sapa. We spent 1 night in Cuc Phuong National Park. Did some trips here on motorbikes, no crash helmets & up to 3 people per bike. Highly recommended, not. Moving down to Hoi An and Hue the architecture was pretty impressive, although had suffered a lot of damage. Sign in Hotel room "Rule 8 - No stinking things in room (even prostitutes)". We had some gin & tonics in Hue and did the usual, remove the ice-cubes and throw them out into the gutter. At this point the barman came running out brandishing a copy of the menu which had an additional line at the bottom. "For tourists - all our ice cubes are made from distilled water". I think we hurt his pride. Finally based in Ho Chi Minh City (Saigon to you and me and even the locals call it this) we were able to visit the Cu Chi tunnels and take a day trip to one of the islands with a good beach (Back Beach). $1 for a cyclo ride, and they'll pick you up in time for the return boat. Our visit coincided with the 25th Independence celebrations (accidentally) so we were quite surprised to see Senator John McCain and wife Cindy in the lobby of the Rex. We would watch CNN on TV in the morning and then see the correspondents down at breakfast in the Caravelle. The bird watching was fairly difficult. My biggest list came from the specimens in rice wine demijohns. We tried the snake wine - tasty. Had snake in black-bean sauce and one meal on a boat in Cat Ba where the seafood was all live kept in nets under the boat. 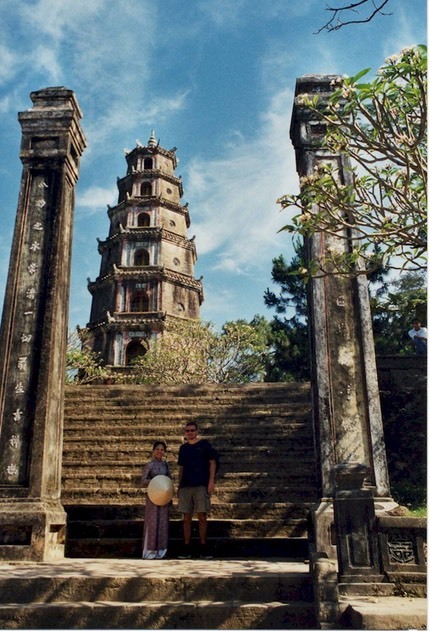 This was probably the most impressive temple, and is also where the car is that took the monk to Saigon, who set himself on fire in the sixties. Loads of temples along the Perfume River. Fascinating to see, as its a pilgrimage for Vietnamese as well, so you are seeing the infrastructure that they use. Huge eating & sleeping points along the tracks. 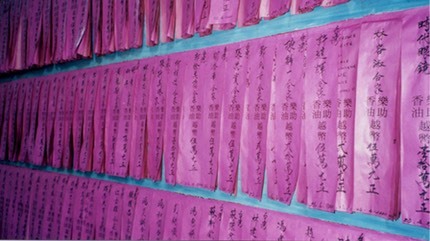 Big on temples, you write your prayer and dedications on these papers and hang them up for the gods. One of these says "West Brom for the premiership" - they must work. Real people, real market. You could buy a dog here for supper. Rover to go, please. They claim to have invented Tartan before the Scots. I'm happy to support that view. 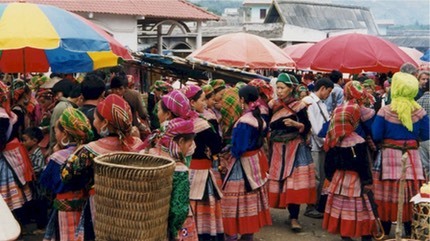 Train to Sapa, do it, but take food and drink. 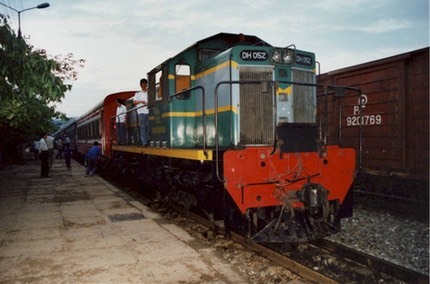 This is a 12 hour plus trip on a sleeper. Luxury cabin but still a hole in the floor for the loo. Mind the Gap! 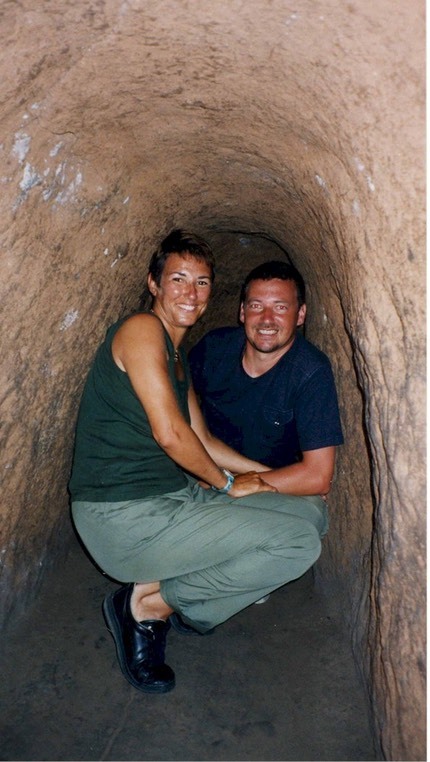 In the Cu-chi tunnels. Really hot. There were bats and geckos in the tunnels, just to liven things up. They are built on 3 levels and you get to be up to 8m under the surface. Advice: take a towel! Not for claustrophobics as you have to do 150m under ground before you exit.